Humble Texas, and Humble Texas Hotels. The town was named after early settler Pleasant S. Humble, who operated a ferry on the San Jacinto River before the Civil War. Humble ran a commissary, cut timber into railroad cross ties and served as a Justice of the Peace. In 1876 the town was a flag station on the railroad. Humble was on the Old Atascosa Road - a trade and cattle trail that crossed the San Jacinto River at Humble, the Trinity River at Liberty and the Neches at Beaumont. 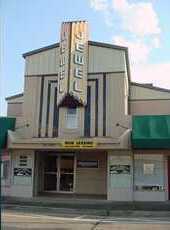 The terminus was Opelousas, Louisiana. By 1880 the population of Humble was a mere 60. Mill owner Charles Bender purchased the townsite and established a commissary for the lumber mill workers. He issued trade tokens to maximize profits. A post office opened in 1886 and the next year Humble had a school, two hotels, two stores, and the sawmill. In 1894 the existing railroad was taken over by the Houston, East and West Texas Railway. In 1904 oil was discovered in the area. The population soared to 10,000 and the following year the Humble oilfield was the largest field in Texas. In1906, however, with reduced production, the population declined to 7,500. Ross S. Sterling, who founded Humble Oil in 1911, once operated a feed store at Humble. His company relocated to Houston in 1912. 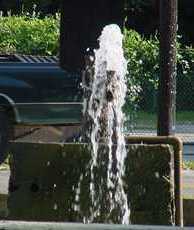 An oil well drilled in 1912 struck water and the hot sulphur artesian water has been flowing ever since. A bathhouse was set up by a Mrs. Mary Standley who charged .25 per bath (including soap). 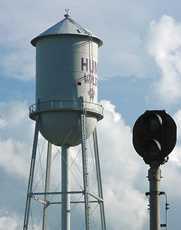 By 1914 the population of Humble had shrunk to only 3,000. During World War I elements of the 19th Inf from Fort Sam Houston were stationed at Moonshine Hill. The Moonshine Hill Road is ruputed to be the oldest paved road in Texas. A reminder of WWI exists today in the name of Belleau Woods Drive. In 1918 a fire destroyed "several saloons, stores and a cafe." In the 30s the population dropped to 1,500. Hwy 59, which was begun in 1932 as a two-lane highway, was finally opened in 1970 as the four-lane divided highway we know today. 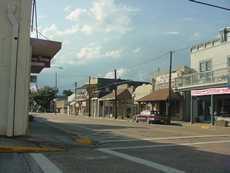 Humble passed a city ordnance prohibiting saloons in 1936. Prosperity returned when World War II brought workers back to the oilfields. The population doubled, but increased mobility eventually drained off people who chose to commute to Houston. 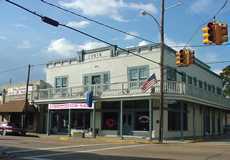 The old city of Humble has been preserved by antique dealers and store owners that have kept the early commercial buildings intact. 214 acre facility. 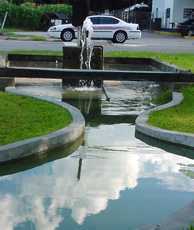 Garden, arboretum, picnic areas, and nature trails. Lake Houston - FM 1960 East. Fishing and watersports. Humble has a very entertaining history that was published in 1976 by the James Tull Chapter of the DAR. The book introduces readers to colorful characters the type of which they just aren't making anymore. Like Constable Marvin "By-Jingo" Winters, who was known for his favorite exclamation and who died in 1937 directing traffic on the new Hwy 59. Or Ed "Danger" Dangerfield Foltz who wore a Tom Mix white Stetson and wore twin .45s. Also known as "Mr. Tough," Ed wore a blue serge suit (summer or winter) with the pantlegs tucked into hightoped boots. In the book Friend N. Kenyon wrote of his father, an early Humble settler: "My father Thomas A. Kenyon was born in New York State. He studied McGuffy's Reader and went through the same arithmetic book over and over until he finished his schooling." The book also mentions Vinny Baily - who was Humble's oldest resident at the time of the book's publication. Born in the Rockwell-Caldwell area in 1870, Vinny who gave birth to 11 children and outlived nine of them, was 106 when she was interviewed.